Here it is: marzipan for the poor man, or a marzipan sweet for people allergic to nuts. Marzipan has always been a very popular sweet in the Christmas time in Germany, and especially marzipan from Lubeck is known as the finest and best. Now Lubeck is in West Germany, and before the fall of the German wall in 1989 the people living in East Germany had no access at all to anything produced in West Germany. 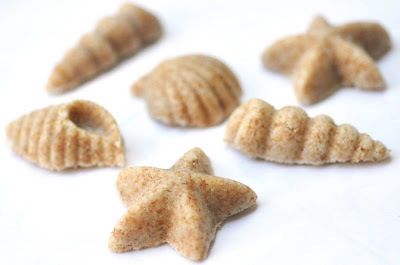 The other day, I talked to my mom about homemade marzipan and she told me that in East Germany we used to make mock marzipan at home, as nuts in general were hard to get in the shops or very expensive. I asked her to find the recipe for me. I tried it with whole spelt semolina to give it a bit of a healthy touch. It worked fine. According to my mom's handwritten cookbook, the amount of butter can vary from 125g to 250g in 250g semolina. I worked with the amounts given below and was happy with the result. Give it a try or two and you'll see what works best for you. Combine the basic ingredients and your preferred flavoring and knead until well combined. The batter should well stick together. If the mixture becomes too dry, add a little condensed milk. Make balls of the size if a cherry, and roll them in your favorite coating. Alternatively, press the batter in candy/marzipan molds. 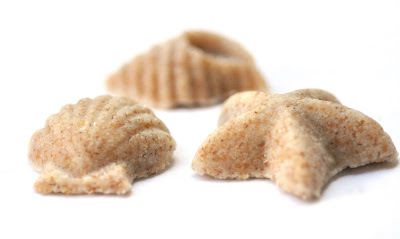 Keep in the fridge to cool, then press the marzipan shapes out of the molds.